President Maithripala Sirisena made his first visit to the Asian Development Bank (ADB) headquarters on Thursday during a state visit to the Philippines and met with ADB President Takehiko Nakao. 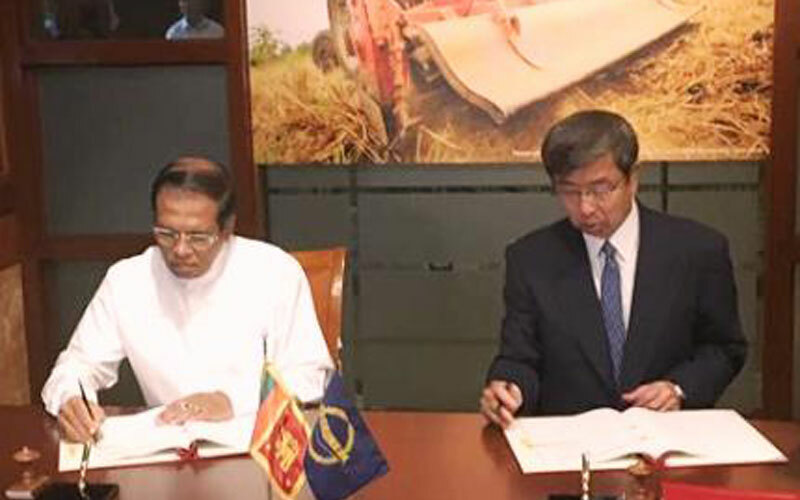 During the visit, Sirisena and Nakao discussed development challenges faced by Sri Lanka and ADB’s role in helping address them, and signed three loan agreements totaling $ 455 million for projects in higher education and transport as well as a technical assistance loan in the urban sector. This year, ADB’s total commitment to Sri Lanka, including these three loans, will amount to $ 815 million. ADB will continue to maintain a strong pipeline of projects totaling about $800 million a year in the current Country Partnership Strategy (CPS), 2018–2022, compared with $500 million a year in the previous CPS period. He acknowledged the government’s fiscal consolidation efforts, supported by an International Monetary Fund program that resulted in a primary surplus in 2018 for the first time in 63 years. “The government has taken encouraging steps to strengthen the country’s public finances and it is essential to continue those measures to reduce debt,” said Nakao. Nakao appreciated the steps introduced by the government to improve the business climate, increase exports, and attract foreign direct investment. He stressed the need to continue those reforms to draw foreign investors to the country which can bring knowledge and new practices. It is also important that Sri Lanka strengthens its linkage to regional and global value chains. “ADB’s technical and financial assistance to support the development of capital markets and small and medium enterprises are well aligned with the government’s reform priorities,” said Nakao. The three loans signed yesterday are: (i) $145 million for a project to support the development of science and technology faculties in four universities to nurture a new breed of technology-oriented graduates; (ii) $300 million to finance construction of about 5.3 kilometers of an elevated toll highway to link Colombo’s international port with the country’s expressway network; and (iii) a $10 million technical assistance loan to finance the establishment of a facility that will help improve the design and implementation of urban projects in Sri Lanka.